I felt like Pat O’Connell from The Endless Summer II when he’s all giddy skipping up and down the beach in a state of pure stoke and excitement. There we were, scoring a super fun head high left-hand point break without a person nor man-made structure in sight. After getting comfortable with the break on a handful of really fun waves, I realized I could literally surf all the way up onto the sand. It was a dream come true. I’d catch the wave at the point, surf until I could jump off onto the shore, run back up to the point, paddle out 30 meters or so, and do it all over again. To make things even better, there was no one around. So there was no pressure to perform. I’d never felt so free while surfing. I didn’t have the usual underlying fear of making a mistake and blowing a perfectly good wave in front of other people (stupid ego!). It was just me, Tara, and mother nature’s wave machine serving up the goods. I started to take my time on each wave and slow down, yet still, manage to push harder through my turns than I had ever done before. It was one of the most liberating and fun sessions of my entire life. I felt like I was one with the wave and my trusty 5’8” quad-fin fish was an extension of my body. Meanwhile, Tara was picking off some of the best waves of her life too. I watched on as she kept going and going and going like the energizer bunny surfing a good one. Ten minutes later she was back to the lineup from her 300 some odd meter paddle, smiling from ear to ear. “I think that was the longest wave of my life!” She blissfully shouted from cloud nine. This is just a single defining memory of our time surfing New Zealand. We scored, big time! There were many others. We got to New Zealand in February and spent five weeks exploring the North and South Islands. The majority of our time was spent on the North Island because there are so many world class waves to surf and it’s warmer than the south. February is the end of summer in New Zealand so the weather was still pretty good and warm most of the time, although we did get a handful of rainy days. Over the course of our time surfing New Zealand, we scored excellent conditions in Ahipara, Raglan, Whangamata, and along Surf Highway 45. It was gangbusters! “It hasn’t rained in months,” said our host at The Endless Summer Lodge as we carried our bags up the stairs in the pouring rain. Haha, for us, arriving in the pouring rain was par for the course, but the weather didn’t matter the slightest, that’s not why we were there. We were there for the waves. And they were there for us. They were long, lined up, shoulder to head-high, and glassy. It was out of this world, to say the least. Matter of fact, I witnessed and caught some of the longest waves of my life. I kid you not, I saw a guy catch a wave that had to be 70 to 90 seconds long. Coming from California where some of my local breaks had only 5 to 10-second waves on offer most of the time, this was mind-blowing to me. Normally, when I’m out surfing, I’ll watch someone snag a wave and look back over my shoulder a couple times to see their turns and how long the wave was before it shuts down. Usually, a glance back or two will get the job done. Nope. Not here. I kept peering back over my shoulder only to see this guy still executing turn after casual turn for far too long for my limited mind to comprehend. I couldn’t believe my eyes. “Is he still on the same wave! ?” I thought in absolute disbelief. Yes, indeed, he was. Up to that point, I had gotten a few really fun fairly long waves and kicked out early because I wasn’t sure if there was somewhere to get back into shore if I were to surf beyond this particular stretch of rocky reef. But after witnessing the dude surf right past my usual kick out point on the mind boggling long wave, I assumed there must be a way. It was starting to get dark. So I paddled further up to the peak, waited for the right wave, and when the opportunity presented itself, I turned and burned. I raced through fast sections, performed casual cutbacks, cruised right by where I had previously kicked out and found myself thinking, “Is this thing still going! ?” After a few more turns and plenty of time to reflect I knew I was on the longest wave I had ever ridden. I milked every ounce of rideable shoulder out of that wave. And at the end of it, as I bobbed around on the inside looking for somewhere to get out in the dark, there was, in fact, a not so obvious place to crawl out of the ocean up some rocky reef and into shore. So it all worked out just fine. And yeah, it was a pretty epic intro to surfing New Zealand. After a few days up north in the sleepy town of Ahipara at the rainy Endless Summer Lodge, we started to make our way down the west coast to one of the most famous surf towns in New Zealand, Raglan. 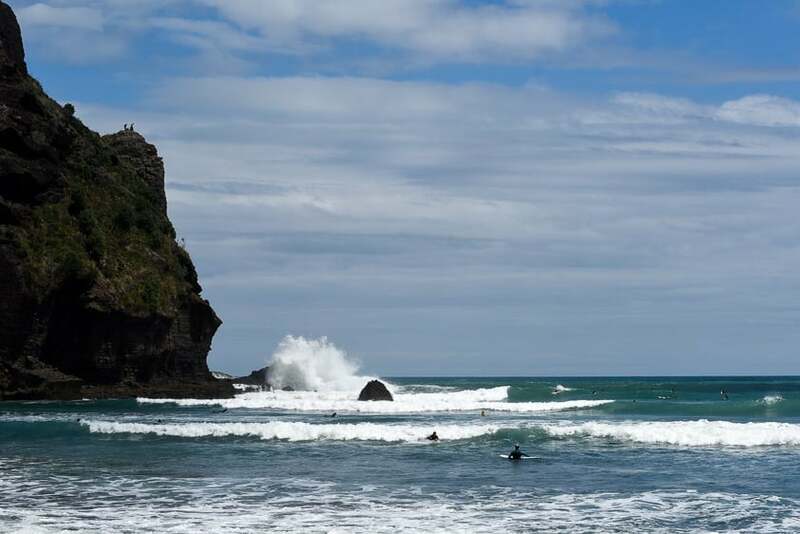 We stopped for a surf at Piha which is known for its wild and rugged beauty. It was a decent size swell, a couple feet overhead at the main peak on the bigger sets, a bit textured, and unruly. I caught a few decent ones and called it a session. There also happened to be an annual surf boat racing competition, The Big Wave Classic, which made for some quality entertainment. Basically, a handful of brave souls on each team attempt to smash out through the pounding surf in what looks like a large row boat without capsizing until they are past the breakers. And then they try their luck at surfing a wave back in with their boat, some more successfully than others. It was very entertaining. We watched a while and then decided to push onward to Raglan. We arrived in Raglan late in the afternoon and went for a quick sunset surf at the beach break in the main bay. It was shoulder high, fairly clean, and quite fun. The forecast showed the swell was building and the winds were going to be light and offshore for the next few days. Our timing was impeccable! 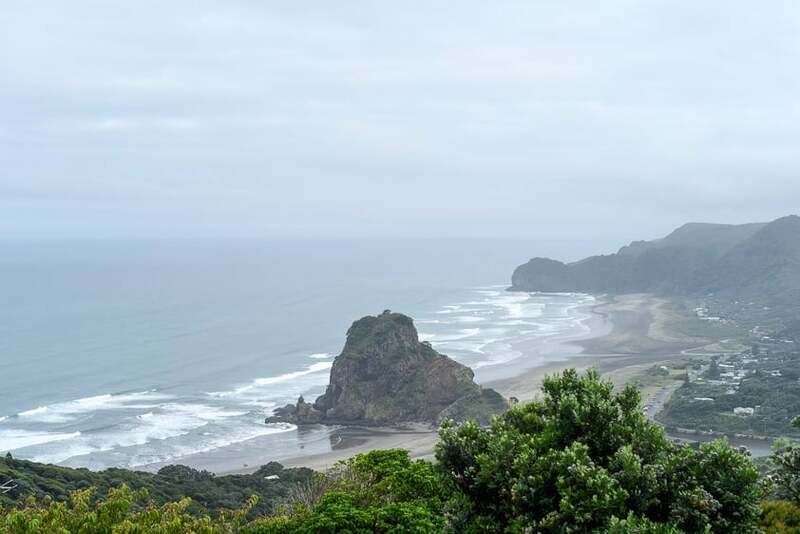 In an effort to avoid the inevitable crowds of Raglan, we did a little research and opted to take a drive down the coast to a more rural beach break. 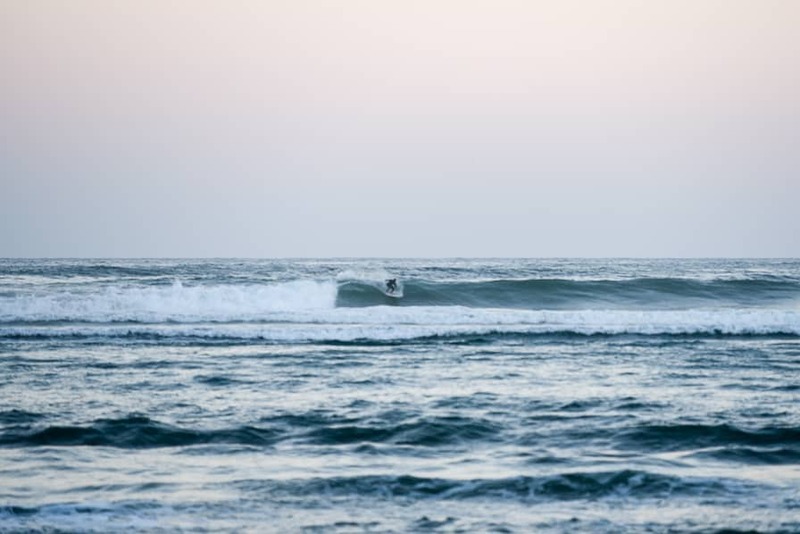 Since the winds were supposed to be offshore and the swell direction was looking favorable it was highly probable that we could score some quality surf. Little did we know, the drive to this remote stretch of beach was as jaw-droppingly gorgeous as the drive to Big Sur on the California coast. 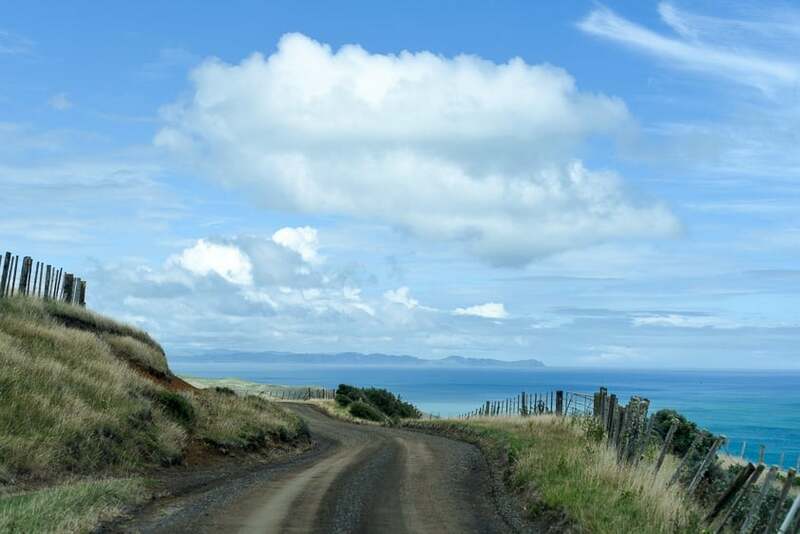 We were stopped in our tracks at every turn by vast amounts of beautiful open farm land, sheep roaming free, and sheer picturesque cliffs dropping straight into the ocean, it was a magnificent and unexpected treat. The surf, on the other hand, wasn’t quite as good as we thought it might be. The size was there, the people weren’t, and the winds were howling offshore. All good things. But it was breaking very fast and mostly closing out. Quite the opposite. We spotted a couple sand bars in the distance that appeared to have better shape. There was only one guy out making the best of it, and another guy suiting up. So I said why not and decided to join the party. Tara opted to go for a run on the expansive and desolate beach. It turned out to be a fun session, I’m glad I paddled out. The swell got bigger and there was some very sketchy close out barrels that steam rolled through, but I managed to pick off a few of the better-shaped walls on offer. A few more guys joined the fun and I saw one guy get a picture perfect barrel and come out clean. I overheard another guy say he was some Indonesian hotshot. By that time, my arms felt like noodles because the current was strong and it required non-stop paddling to stay in position. I paddled to where the guy got barreled in hopes of getting lucky, but nothing else like it came through so I decided it must have been a fluke and caught one in. 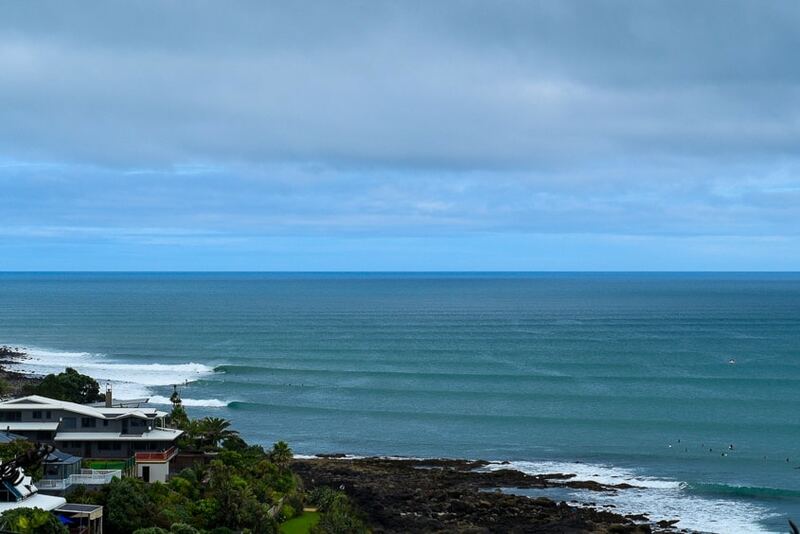 The next couple of days we surfed some of Raglan’s main attractions: Indicators and Whale Bay. The conditions were insane, definitely some of the best waves I’ve ever surfed. Set after set of perfectly groomed walls rolled through peeling off along the rocky coast. Each wave was like a blank canvas for drawing lines to my imagination’s content. The pace of the wave was ideal and the rides were long and surreal. I was in my happy place. On our last morning in town, the swell was still pumping. I surfed for around three hours before we made the two and a half hour drive across the country to Whangamata on the east coast. 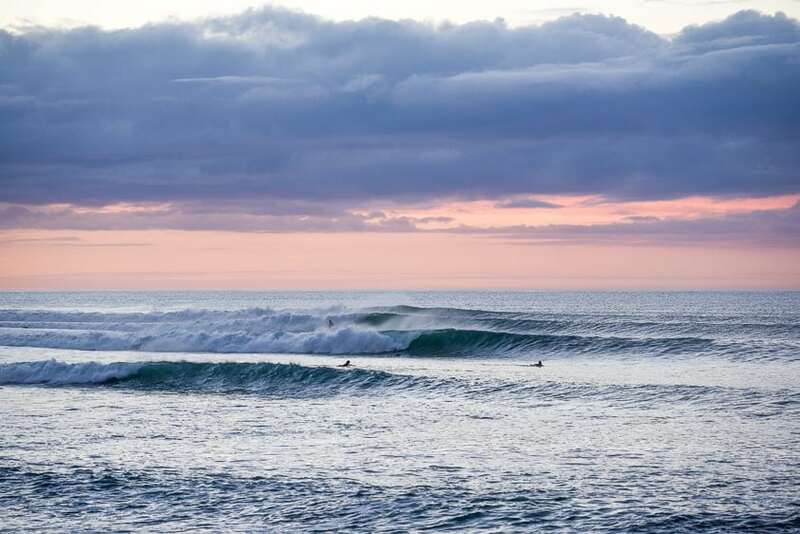 My fingers were crossed and my hopes were high that we just might score the ultimate day of surfing in New Zealand; a morning session at a world-class left-hand point break in Raglan, followed by an evening session at a world-class left-hand sandbar in Whangamata… And we did! We arrived in Whangamata just before sunset, dropped our luggage off, and jammed straight to the beach. A fresh new overhead size swell was filling in. I quickly suited up and followed a friendly local through the boat channel out to the peak. He said he didn’t even know of any Kiwis that had done what I was about to do; a west coast and an east coast surf on the same day both in classic conditions. I had pretty low expectations since I read about the locals having the break on lockdown, but to my surprise, I got three really good waves in a very short amount of time. The three waves I got were so satisfying and had a fun factor that I just can’t seem to pinpoint or articulate. For the sake of trying to describe its utter awesomeness, I came up with what I will call the 4P’s. The wave had what seemed to be the perfect blend of pace, push, power, and punch. It had a special tempo and flow and indescribable fun factor that I couldn’t comprehend. I simply couldn’t register that I had just surfed a more satisfying wave than the perfection I scored earlier that morning at Raglan. 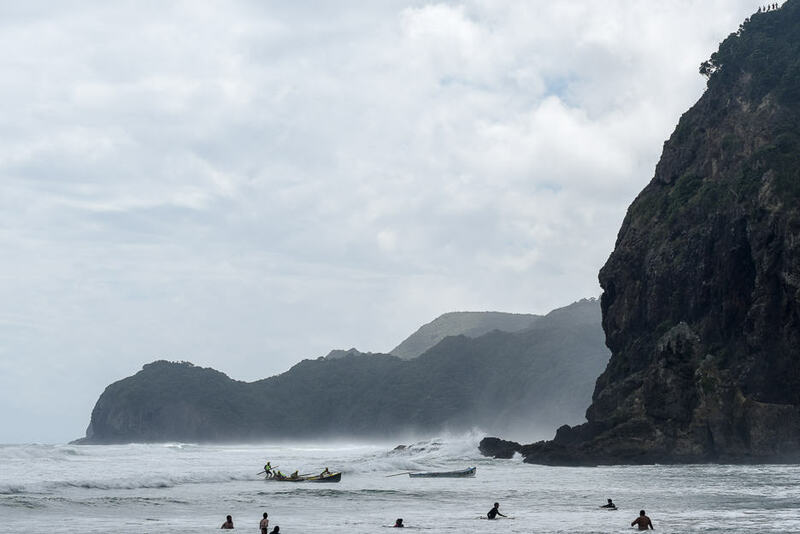 The next day I surfed Whangamata a second time, and it was just as amazing as the first. Could it get any better than this? Yes… yes, it can! After scoring some of the best surf of my life between Ahipara, Raglan, and Whangamata we explored around the Coromandel region a bit and rest assured we had some lackluster sessions in the mix too. Not that you’d wish poor surf on me, but after so many epic days it’s only fair. 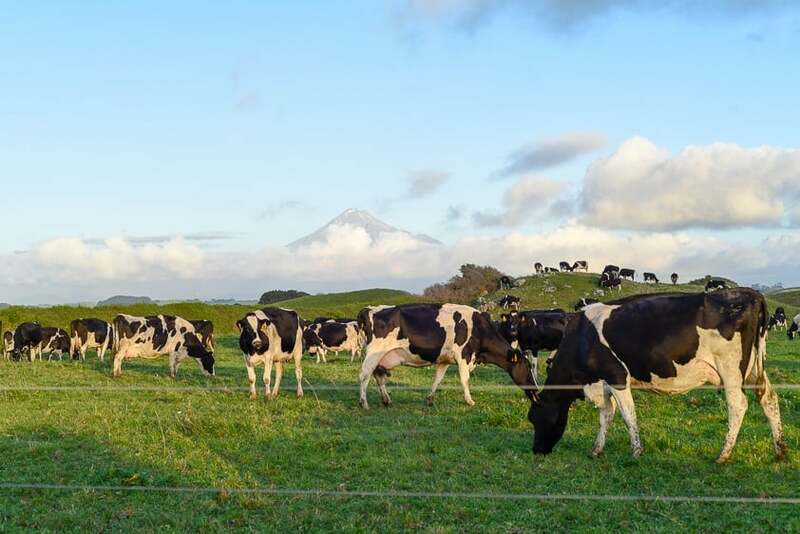 We headed back to the west coast towards Mount Taranaki and Surf Highway 45. And just when we thought that things couldn’t get any better, they did. That was when we had our heavenly lonesome merry-go-round session surfing our way down the beach right onto the sand and walking back up to the point like we were on a wave machine lap track. It was so surreal to be scoring such epic surf and trading waves with my wife and no one in sight. Just me and Tara and nothing but beach and farmland for as far as the eye could see. This will definitely go down as one of my most unforgettable surfing memories ever. We don’t have any photos of the surf (because we were too busy surfing), but just picture farmland meets rural cobblestone beach left-hand point break with peeling emerald green waves. And that was the grand finale of our North Island surf adventure. Then we headed to the South Island where we got into other things like exploring national parks, mountain biking, and white water rafting. 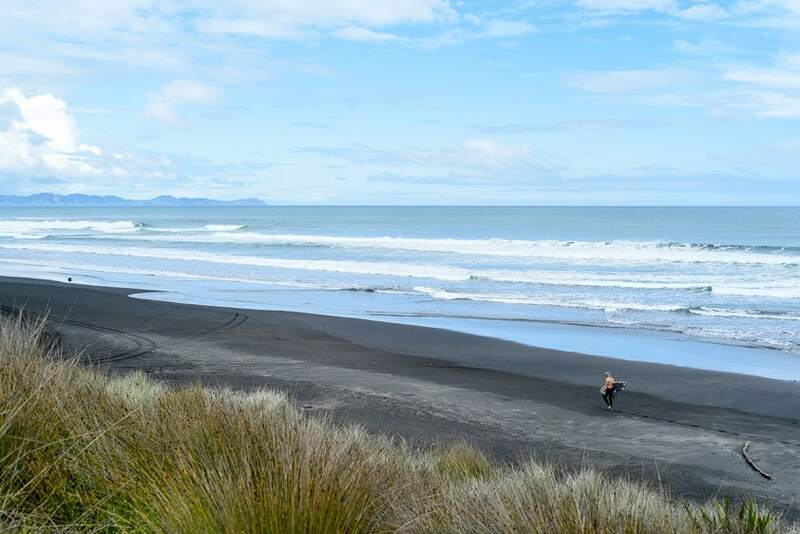 And while we were only on the south island for a total of ten days, we managed to get in one more surf in a quaint little beach community called Sumner Village on the outskirts of Christchurch. 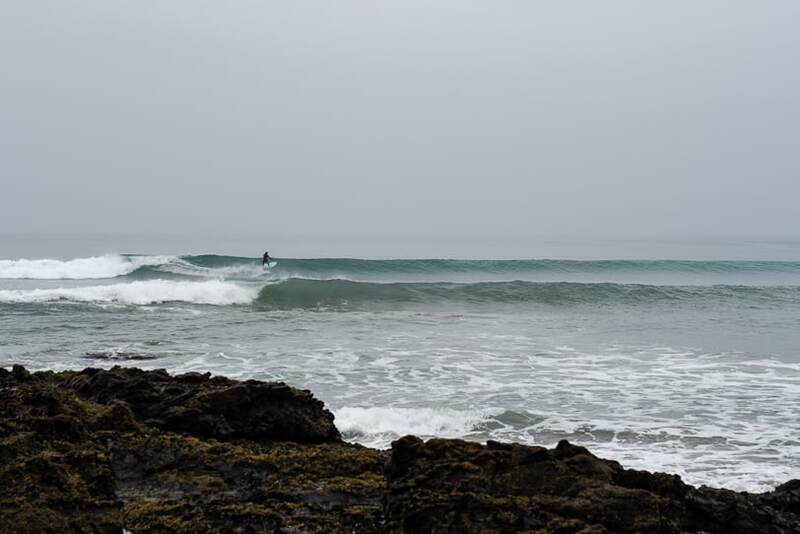 It was raining and too cold for our spoiled soft asses, but we paddled out anyway, caught a few slow mushy longboard waves on our less than ideal shortboards and called it a trip. If you’re planning on surfing New Zealand at any point and want to check out some of the same places we hit, here’s a map that shows our route. Everywhere we surfed was on the North Island except for Christchurch. And you should definitely download the Sherpa Surf Guide App as it was extremely helpful for researching breaks and forecasting surf conditions during our adventure! Loved your article. 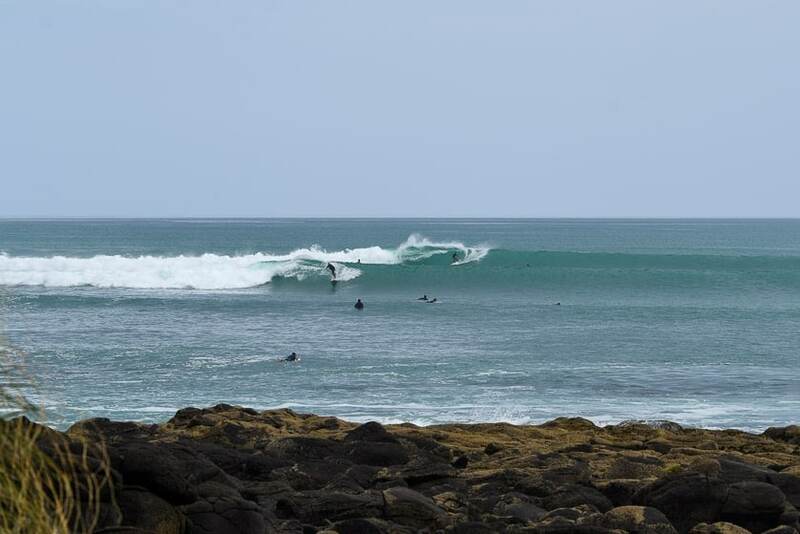 We have some fantastic breaks here in NZ! Hey guys! Loved your article, we surfed the north island 2 years ago and absolutely loved it! Any tips for surf spots on the South? Were heading there this December, and in my research so far I’ve only found a few: Kaikoura, a few spots in Dunedin. Any other tips? Mahalos! Hi Corin, thank for the kind words! Yeah, New Zealand is so awesome, we loved it! There are so many breaks to explore on the North Island, we spent the majority of our time there so we don’t have many recommendations for the South Island. I highly recommend checking out the app Sherpa Surf Guide They have a really great breakdown of breaks and conditions. Otherwise, for the South Island, we did stumble across a really cool little surf community in Christchurch called Sumner. There are a few breaks around there, and it’s a beautiful spot. Hope you have an amazing trip!!! Happy travels! I spent 4 months surfing New Zealand Sept-Dec ’77. Surfed from the north end of the North Island to the South End of the South Island. 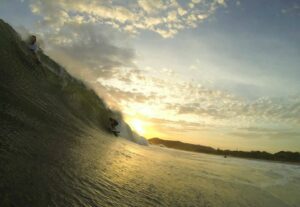 Caught great waves at Gisbourne and Dunedin and Kaikoura and many other spots. Skiied Mt Ruapehu too. Locals were generally great except at Mahia where they were a bit unhappy we were there. Great place great people! Hitchhiked and Stayed at youth hostels for $2 a night! Hey Chip, what an amazing memory and story! Thanks for sharing, that sounds like an incredible experience and adventure. I’m heading out to NZ in November for a couple of weeks and would love to do some surfing on north island. Do you know of any good breaks for long boarding? Hi Jan, awesome, hope you have an amazing trip! You’ll be fine on a longboard on many of the breaks in New Zealand since there are a lot of long, cruisey, line-up left-hand points up and down the North Island. From Shipwrecks Bay up in Ahipara, to the various points in the Raglan area, to a couple along Surf Hwy 45, I think you’ll have a great time on a longboard at any of the pointbreaks really. Which there are plenty of. Thanks for stopping by! Enjoy your trip! Cheers for the info. Can’t wait to get down there and get amongst some good lefts! Hope you guys are doing well. Look forward to some more hot tips from Lush Palm and hope to see you then. Kia Ora! I like it. Look at you brushing up on your Māori. Good on ya brother! 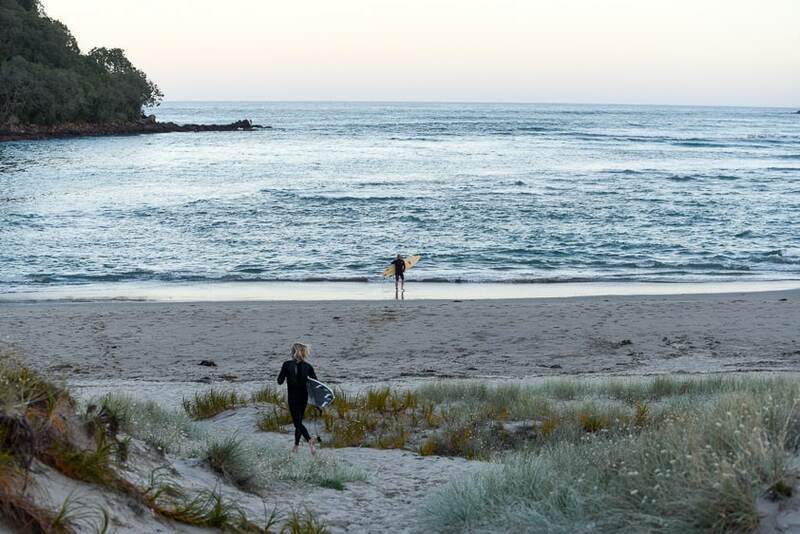 Yeah, that’s a great excuse for a surf trip. Hope you score some incredible waves. Dave here from the Gold Coast, we crossed paths in Samoa and again when you stopped by in Australia for a visit on the Gold Coast. I’m heading off to NZ for a driving surf trip in Early February next year. My time is limited, So I was wondering your tips for maybe your top 5 spots in the north island. Obviously Rags will be on the list. But was hoping for a few rights also. Was looking into Costa Rica/Nicaragua but am now sold on New Zealand. What time of year did you go? Thinking about spending a few months here; any recommendations on a place to home base? Hi Derek, Costa Rica and Nicaragua are both awesome places where you can score amazing waves! But yes, New Zealand, the land of the left-hand point break, is a pretty epic place to spend a few months too. Haha. Decisions, decisions… We were there for most of February and a little of March, which was a great time. End of their summer, beginning of fall. As for a home base, that’s a hard question, because you really can’t go wrong and it depends on what you’re looking for. You’ll definitely want to spend some time in Raglan. 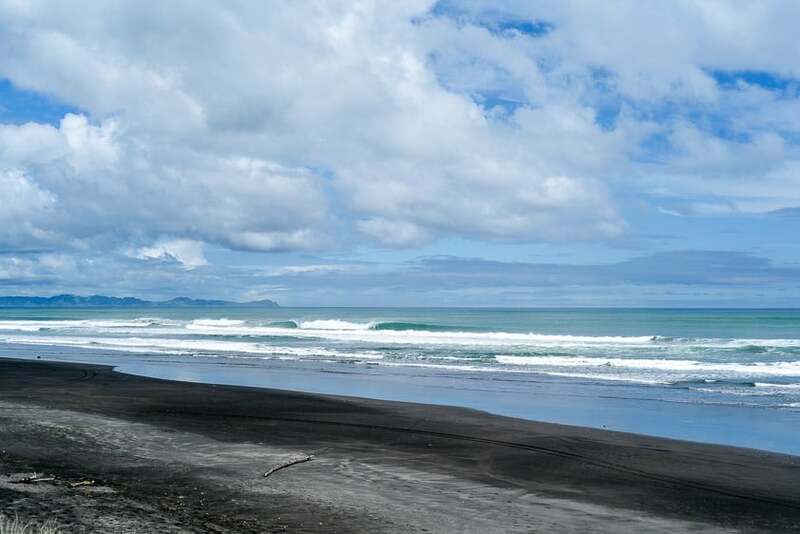 And Raglan could be a really good home base because it’s somewhat central to many of the North Island surf hubs and there is a ton of surf in and around the area. 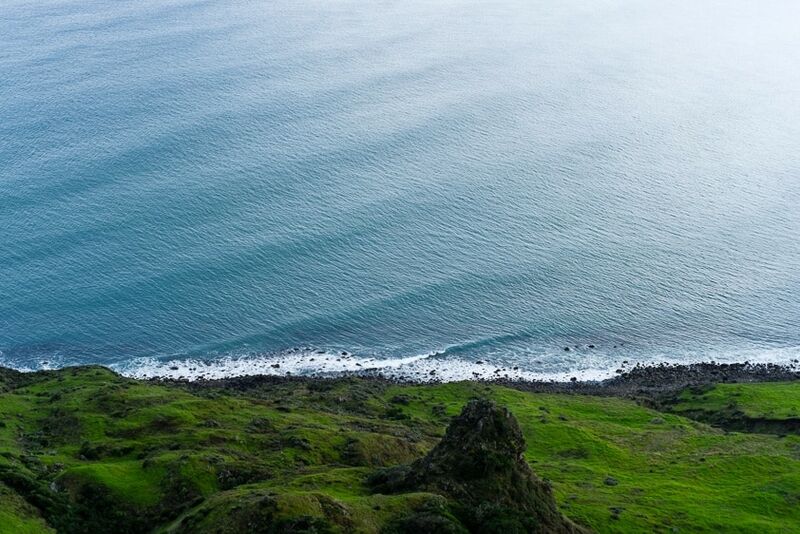 Be sure to explore Surf Hwy 45! Hi Dr. George, sorry for the delay, been traveling and running around a bit the last week or so. Anyways, we did rent a car. I don’t recall what we paid but I just looked and it’s about $30 USD per day or so, which comes out to about a thousand for a month. If we were going to be there for longer, like over 2 months, then we would have probably looked into buying a cheap used car as well. But for us only be there 5 weeks I think it made more sense and was a lot easier to just rent. As for the Endless Summer Lodge, it is walkable to Shipwreck Bay and the points out back where we surfed. Maybe about a 10-15 minute walk to where you can park on the beach right in front of Shipwreck Bay, then another 10 minutes to walk around to the points beyond. If you have a car with some clearance, you can just drive on the rocky reef and save the walk. Hope this helps, enjoy!